The TechMaster is a family of inexpensive super simple two scene preset DMX lighting control consoles. The modular system can be configured for 12 to 144 or more channels. All Techmasters can be conventional two-scene with two rows of sliders (X&Y) and split crossfades. An added feature is the "hold and fade" mode which offers a virtual second scene while in the single scene mode doubling the number of control channels. All TechMasters come with grandmaster, blackout switch, XY crossfaders, and chase special effects controls. The TechMaster 12/24 is configured for 12-channel 2-scene operation or 24-channel single-scene operation with the flip of a switch. Its modular system architecture allows for consoles that can be configured multiples of 12 channels in two-scene mode and 24-channels in single scene mode. The grandmaster slider affects all channels proportionally and is used to fade to black or up from black. When the slider is down, the associated LED is on to remind the operator of this state. The blackout button is used for a sudden blackout: all lights on stage go out and the LED flashes red, reminding the operator to press the button again to leave blackout mode, preferably with the grandmaster slider down so the lights can fade up smoothly from black. The channel sliders are arranged in two scenes, X and Y. With the crossfaders both pushed to the top of the slots, the X scene is active and channel levels set on the X scene appear on stage. Levels for the next look may be set in the Y scene without affecting levels on stage. At the appropriate time, the operator slides the crossfaders to the bottom of the slots, and the Y scene becomes active and the look set in the Y scene appears on stage. Levels for a new look may then be set in the X scene. The SS/2S switch toggles the controller from two scene to single scene mode. The switch is only read on power up. In single scene mode, the number of control channels is doubled. For example, on the TM12/24 the top row is channels 1-12 and the bottom row is channels 13-24. The hold button adds a virtual second scene so the operator can crossfade from one look to another even in single scene mode. The console features a user programmable chase sequence. In a chase, lamps are lit in sequence according to the chase program. The level of the chase can be set with the chase level control. If manual faders are set to light some lamps at a particular level, the chase piles on that level (the higher of the chase level or the channel level takes precedence). Note also that the chase level is affected by the grand master and blackout controls. In addition to the level of the chase, the speed of the chase can be varied with the front panel chase rate control. If either the chase rate or level is set to zero, the chase is suspended and will start again when the level and rate are above zero. The chase includes three chase modes. These are forward (green LED), reverse (red LED), and build (yellow LED). Pressing the chase mode button switches from chase off to each of these modes. Forward executes the chase sequence in the order it was programmed. Reverse executes the chase in the reverse order it was programmed. Build executes the chase in the order it was programmed, but leaves each lamp on after it is brought up in the chase until the chase sequence is completed. Once the chase sequence is completed, all lamps in the chase go out. The chase builds bringing up more and more lamps, then they all go out. The Sublime is an add-on module of the Techmaster controllers. The Sublime module has 24 submasters which are fully overlapping and proportional. Just set the look on the manual board, hit the “record” key, then hit the submaster bump button for the submaster channel you want, and that’s it! You’ve just recorded a look on that submaster channel. The Sublime does not require modes, or pages, or keypads, or displays (it is super simple). Multiple submaster modules can add 24 subs at a time to the Techmaster. The Sublime remembers its looks and is just as easy to reprogram or clear. When you need more than just a manual two scene board, but don’t need computer memory control, the Sublime is the easy answer. The IQ512M is a memory lighting control console designed for television studios, houses of worship, small stages, and nightclubs. The console may be used with up to 512 dimmers. It stores an unlimited number of cues and shows on standard MMC and SD cards. Also it stores a distinct look on each of its sliders through a full proportional softpatch. Smooth fades from one look to another are executed through standard theatrical split crossfade controls. A hypertext menu on a backlit LCD display guides the user through all operations. Memory cues and the softpatch are saved automatically and held indefinitely. Shows may be edited offline on any personal computer. The IQ512M can also serve as a Remote Focus Unit, easily allowing control of any of 512 channels. Finally, it can capture a look from another console making it easy to use as a backup. See additional details below, in the Wall-Mount section. The Wall-Mount version of IQ512M has all the capabilities of the console version above but has been repackaged for use in 19-inch racks or permanent architectural installations. The IQ512M stores 8 user patch tables. Patch tables can be edited to have each control slider drive up to 512 dimmers with distinct levels. One-to-one and wrap patches are easily loaded. In television applications, the patch table is often used to save a "look" on an individual control channel. Bring up channel 1 for news, channel 2 for sports, channel 3 for weather, channel 4 for the newsroom, etc. The IQ512M creates, edits, plays, and deletes shows stored as text files on MMC/SD cards. The card may be removed to be backed up or edited on a computer. Cues created on the IQ512M include a cue number, fade in and out times, a fade delay time, and 12 control channel levels. These levels are run through the patch table on playback to control up to 512 dimmers. Individual cues may be inserted, deleted, or rewritten on the IQ512M. When editing offline, cue descriptions and individual levels for each of up to 512 dimmers may be added to a cue. Cue playback consists of selecting the show, then using the split dipless crossfaders to fade between the cues of the show. Cues can also be played by hitting a GO button, which starts a timed fade out of the old cue, a delay, then a fade in of the new cue. Fade and delay times are set by the user during show creation or editing. The top line of the display shows the currently "live" cue, while the second line shows the next cue. The up and down arrow keys may be used to change which cue is next. The IQ512M features "hold and fade" two scene operation. Press the hold button and the current look will be held. Set the control sliders for the next scene, then slide the split dipless crossfaders to the opposite extreme to bring up the new look. Hit hold again to set up the next scene and move the crossfaders to make it live. The IQ512M features a DMX-512 input. IQ512M controls "pile on" to the settings of the console driving this input. This allows console combining without the expense of a DMX combiner. In addition, settings on the external console may be captured and saved to a control channel in the patch table. This is a quick way of putting a different "look" on each control channel. Finally, DMX data from an external console may also be captured to a cue in the cue stack. 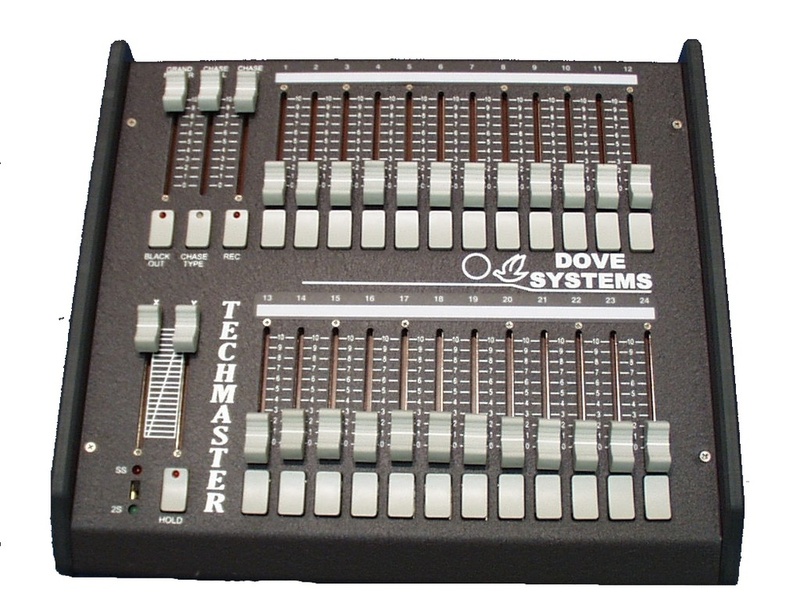 This is a great way to add memory features to a manual control console like the TechMaster. Capture a show from your Big Console and play it back on your Little IQ512M. The IQ512M includes a Remote Focus Unit mode. This mode allows quick access to all 512 dimmers for test and focus of fixtures. The SceneMaster 6 is a simple, rugged two scene board with six 1000 watt dimmers built in. It features six channels arranged in two scene preset configuration, a single crossfader, a grandmaster slider, a blackout switch, a crossfade timer, and bump buttons for each channel. Extremely easy to setup and use, it requires just two wall outlets for power. With dual U-Ground (Edison) outlets in the back, output loads plug right in. Add a foot switch for hands-free crossfades and blackouts! The SceneMaster Six comes in two versions. The DUG has common Edison outlets, and the SSP uses Stage Pin connectors. With dual U-Ground (Edison) outlets in back, output loads plug right in. Single Stage Pin outlets are included on the SM6-SSP.